Thanks to the Canadian Cancer Society for turning Amanda's notes and one of my photos into a concise and moving message for Ovarian Cancer Awareness Month. This was posted on Facebook and has been spread widely. 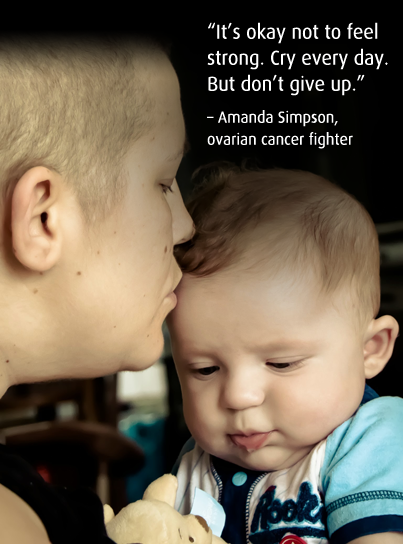 Amanda is a proud mother, cancer fighter and passionate advocate for ovarian cancer awareness. A good, tight summary of it. Barb and Wendall have been amazing through this, taking care of Gordon every day. I wouldn't have been able to keep working without them. I wouldn't be able to visit Amanda in hospital without them. She wouldn't see Gordon in hospital without them. As for the stats -- it's hard not to feel defeated by the numbers, but every case is unique. Amanda's found solace in the notion that she's not bound by everyone else's statistics. She's a case study of one. Her circumstances are not the same as everyone else's. That doesn't mean she's excepted from the hard realities, but it gives her room to breathe when looking at numbers that are frankly disheartening.